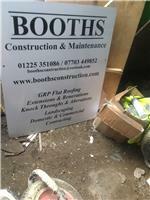 Thank you for taking time to view Booths Construction's page. We are a small team of self employed tradespeople, carefully selected for our specific skills and customer service. We take on domestic and commercial projects, applying ourselfs to any service (except plumbing or electrics).